Stock photo of the General Store as seen from alongside the Hochfeld House in the Mennonite Heritage Village in Steinbach, Manitoba, Canada. 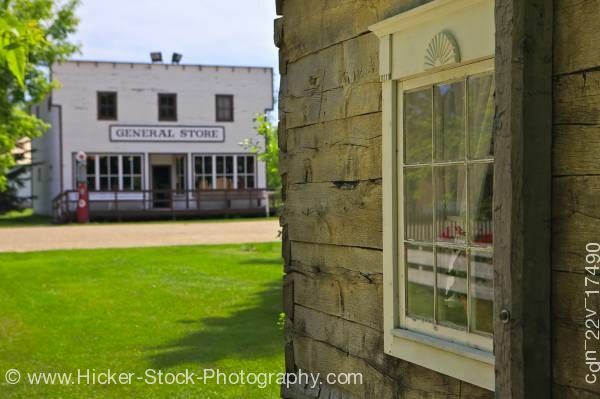 This stock photo includes the General Store's storefront as seen from beside the Hochfeld House, looking across a green lawn and dirt road toward the historic old store at the Mennonite Heritage Village, Steinbach, Manitoba, Canada. Detailing lives of the Mennonites' faith and culture from the 16th century through today, this recreated village sits on 40 acres and is open year around. At the general store one can buy hand-crafted items made by local artisans. Hochfeld House is of the earliest log dwellings built circa 1877, by Johann and Katharina Wiebe. It was modified many times and remained occupied until 1985.